We believe social media is uniquely suited to connecting brands with customers on a deeper level. To ensure that depth of relationship, however, brands must do more than simply “talk” to their audiences; they must communicate in a way that resonates with their audiences’ passions, interests or curiosity and compels them to engage. Following are a few key components of this very worthy quest. 1. Keep your eye on the goal, which is to take your social media and content marketing from okay or good to outstanding and memorable. Ask yourself: How can I best tie social media to my desired business outcomes? How can I empower and mobilize my employees and customers to maintain a dialog? 2. Create a position of thought leadership among social followers. This involves having the type of information they will search for – and use. This means content that addresses issues of importance to them, gives them an “aha” to pass on or, especially, solves a problem for them. The right back-end work can steer initial searches to you, and the right content will make you a go-to source the next time. 3. Treat social media as a strategic asset. This means integration into marketing to support strategic marketing, alignment with brand messaging and going beyond timely information to forward-thinking posts. 4. Listen and learn. At Next-Mark, “social listening” goes beyond the basics of tracking share of voice and brand mentions. The real value comes from the insights our analysts glean from reviewing real consumer conversations. These insights can help inform brand decisions on everything from marketing campaigns to product development and customer service practices. 5. Leverage content to build community. You want content that not only creates engagement, but also converts browsers to buyers and is worth their sharing with others. Perfecting your content can take time, but it’s time well spent, as it produces leads, sales and other business-centric results. 6. Create an optimal list of platforms that work for your company. Sure, there’s LinkedIn, but you may be surprised how many once purely social networks have B-to-B relevance. These include leaders such as Facebook, Twitter and YouTube, as well as newer platforms, such as Instagram, Periscope, Pinterest and SnapChat. 7. 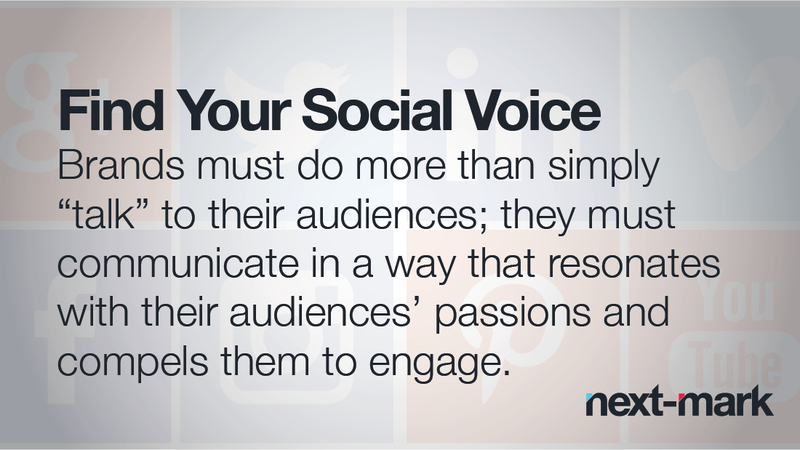 Respect social media as a powerful brand advocate. This involves paying close attention to your brand’s social reputation, identification of your online advocates and other influencers and quantification of your reach and influence on each platform. 8. Know when to hold’em (advertising dollars, that is). Know when to be organic or paid in your approach. Strategically smart targeting paired with real-time optimization results in ads that resonate with the community and exceed goals. For many brands, using an “organic-like” approach, which combines quality content creation, community management and efficient paid media, has dramatically cut cost per engagement and increased share of voice, channel growth and engagement. 9. Get analytical. Understand and track your social milestones with relevant and timely insight, whether using a proprietary or custom tool. Above all, remember that Next-Mark is here to help you in creating engaging content firmly based on a sound, effective social marketing component to your strategic business plan.